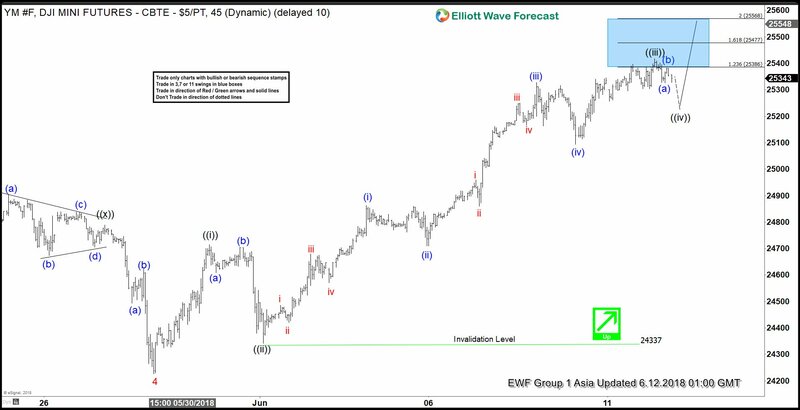 Dow Jones futures ticker symbol: $YM_F short-term Elliott wave view suggests that the pullback to 24227 low on 5/29/2018 ended Minor wave 4 pullback. Above from there, the rally is unfolding as impulse Elliott wave structure with extension in 3rd wave higher. As impulse, the internal of Minute degree wave ((i)), ((iii)) and ((v)) should also unfold as an impulse with 5 waves structure. Up from 24227 low, Minute degree wave ((i)) ended in 5 waves structure at 24715. Down from there, the pullback to 24342 low ended Minute degree wave ((ii)). The rally from there shows a strong reaction to the upside which could end Minute wave ((iii)) at 25418 high. The subdivision of Minute wave ((iii)) show lesser degree impulse structure where Minutte wave (i) ended at 24863, Minutte wave (ii) ended at 24709, Minutte wave (iii) ended at 25327. Minutte wave (iv) ended at 25093 and Minutte wave (v) of ((iii)) ended at 25418 high. Near-term, Minute degree wave ((iv)) pullback is in progress in 3, 7 or 11 swings. As far as a pivot from 24337 low stays intact, expect the Index to see another push higher in Minute wave ((v)) to end 5 waves impulse structure from 5/29/2018 low. The move higher should also complete Minor degree wave 5. We don’t like selling the proposed pullback.